The usual argument against such a mix of industrial policy and protectionism is that it just won’t work. A country that subsidizes its industries ends up with inefficient industries. “Buy China” protections protect inefficient local firms from global competition, and that ultimately will leave the users of Chinese equipment with inferior products. But China, is, to use Philip Pan’s phrase, the state that failed to fail. Huawei is significant for a lot of reasons. Its origins are complex, but it clearly did not start as a state-owned goliath. It had to prove itself domestically and abroad before it emerged as China’s national champion in telecommunications equipment manufacturing. But Huawei also has clearly benefited from “Buy China” preferences among the state-owned telecommunications firms and enormous amounts of export financing (for its customers, not directly for Huawei itself). And it now believes it has a technological advantage in addition to a cost advantage in the infrastructure equipment needed for 5G. There though is a second argument for taking a measured approach to China’s industrial policies—that their global impact will be modest. China may cut into the United States’ future exports by building its own competitor to the 737 and also cut into Europe’s future exports if Airbus decides to build the A330 in China and China buys "Made in China" Rolls-Royce engines for the C929 and the A330. But ultimately a China that doesn’t import should not export as much. That in a sense is the natural constraint on import substituting policies. A tax on imports is, in international economics 101, also a tax on your exports. That’s the argument Paul Krugman makes to explain the failure of Trump’s protectionism to bring down the U.S. trade deficit. Replace “tariffs” with “domestic subsidies and preferences” that act as barriers to imports and the same process should apply to China. China may succeed in some sectors, but in the process it will effectively give up others. This all doesn’t happen just by itself, immaculate adjustment is myth. Prices need to adjust to create the economic incentives for adjustment. But in theory if you don’t import as much, your importers won’t have much need for foreign exchange. So when your exporters want to sell the foreign exchange they earn abroad to meet payroll and to bring their profits home, they will bid up the price of the local currency. And the stronger exchange rate in turn lowers exports over time. If China 2025 succeeds, in other words, China should both import and export less. Those manufacturing sectors in the United States and Europe that now export most heavily to China will be hurt, but the aggregate global impact will be modest. The macroeconomic basis of China’s post crisis adjustment is fragile. The post-crisis fall in China’s surplus has come from a mix of a (off-budget) fiscal stimulus (financing local government’s investment in infrastructure) and a huge increase in domestic credit. **** Investment as a share of China’s GDP, including public investment, is above its pre-crisis levels. It is still 45 percent of China’s GDP. That's ten percentage points of GDP above its 2000 level. And the IMF, among others, thinks that China’s current macroeconomic equilibrium is intrinsically unstable, as it relies on an unsustainable stimulus that is leading to an unsustainable increase in debt. Basically keeping China’s current account surplus low when China’s national savings rate is close to 45 percent of its GDP—and the household sector’s savings is 23 percent of China’s GDP, 15 pp of GDP above the global average—is a challenge. The intersection between China’s industrial policies and its incomplete external adjustment. In a normal economy, a reduction in imports would push the currency up and reduce exports—creating a natural mechanism for bringing the world into equilibrium. 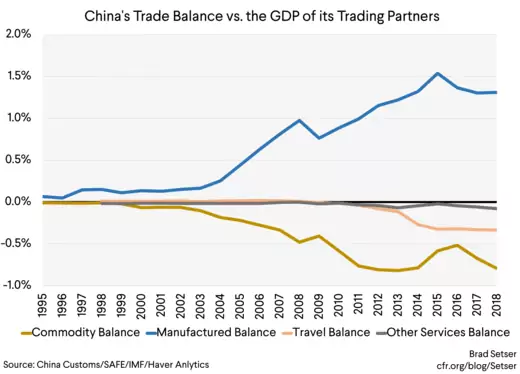 China would import fewer aircraft and chips, and export fewer routers and switching machines (Huawei) and industrial engines and the like (or in China’s version, less apparel and low-end electronics). But in China’s case, it is possible that the economic boost from substituting Chinese production for imports (a rise in net exports) would be offset by a reduction in China’s stimulus. That would offset the pressure that otherwise might be there for the yuan to rise. Thus China’s industrial policies could end up reducing China’s imports in some sectors where it now imports a lot without automatically reducing China’s exports. It is hard, at least for me, to envision a win-win from the negotiations around China’s import-substituting industrial policies. I wouldn’t consider U.S. civil aviation suppliers shifting production of aircraft components to China to get orders a “win” for U.S. workers. China wouldn’t considering scaling back its import-substitution policies a win. 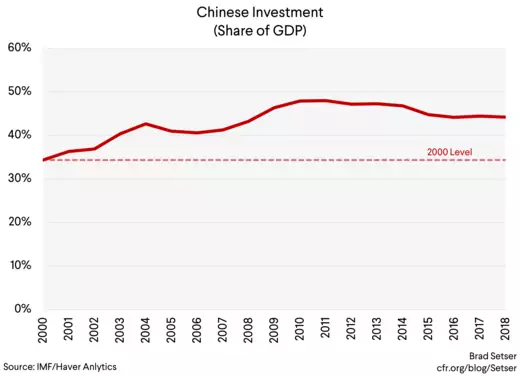 The win-win would come from expanding China’s social insurance, and reducing the massive pool of domestic savings that, in a sense, lets China invest freely in a range of risky catch-up projects without having to worry too much about the losses it incurs along the way. ***** Bringing down China’s domestic savings rate to put China’s external rebalancing on a more sustainable footing. * "Buy China" preferences are a non-tariff barrier, just one that can be implemented through informal guidance provided to the large state enterprises and to the “private” national champions that need to stay on the right side of the Chinese party-state. "Buy China" preferences together with domestic subsidies in the sector come close to providing the kind of subsidy for import-substitution that the WTO in theory prohibits, but, well th preference isn't explicit. ** A good example is China’s support for its “indigenous” semiconductor industry. It doesn’t just have one big fund to subsidize its semiconductor industry (the "Big Fund's" investors include China Tobacco and China Mobile, as well as the China Development Bank "Capital" arm). It has over thirty, counting all the provincial funds. They have backed a number of different projects. Multiple DRAM fabs for example (Fujian Tsinghua is only one, Innotron is also trying), a couple of NAND projects (Yangtze Memory Technologies and likely the investments of Tsinghua Unigroup). Several contract manufacturers. And so on. These efforts in turn are supported by Huawei’s own industrial policy as it seeks to replace imported components with chips of its own design (Huawei has its own chip design subsidiary—HiSilicon; fair enough it is a form of vertical integration—but also clearly one that puts Huawei on the right side of "Buy China’s" industrial policy goals). Another example is in electrical car technologies. China has supported an enormous number of battery companies for its electric vehicle industry, and made access to the new electric vehicle subsidy contingent on using a Chinese battery. And so on. **** China’s modest current account surplus is a product of a still large (real) surplus in manufactures (almost as big as it has ever been relative to the GDP of its trading partners), a large (very real) deficit in commodities (also as big as ever, as higher import volumes have offset the fall in price since 2014), a large deficit in tourism (probably around two-thirds real and one-third a function of mismeasurement; note the big jump in 2014), and roughly balanced trade in other services.